Animal organs. Integument. Eccrine sweat glands. Atlas of plant and animal histology. Organ: integument, eccrine sweat gland. Eccrine sweat glands are tubular non-branched glands. They release their content directly over the surface of the epidermis. In humans, these glands are localized for almost the entire skin of the body, but are more abundant in the palms and soles. Eccrine sweat gland are structurally divided into secretory part and excretory part. The secretory part is simple cuboidal or columnar epithelium arranged in curled and twisted tubules that altogether form structures known as glomeruli, which are located in the deep dermis or in the hypodermis. In the basal surface of the epithelium there is a well-developed basal lamina. Three cell types are distinguished in the secretory part. The more numerous are those showing a clear and vacuolated cytoplasm and a nucleus located in the middle of the cell. These cells are serous, with abundant lipid droplets, sometimes containing pigments. They synthesized substances in aqueous solution. Mucinous cells are darker, with more endoplasmic reticulum and contain some secretion basophill granules. These cells produce glycoproteins. In the basal part of the epithelium, in contact with basal lamina, there are myoepithelial cells that help the secretory content to be released to the lumen of the tubule. The excretory ducts, that conduct the secretory products to the skin surface, cross the dermis and epidermis bending many times. 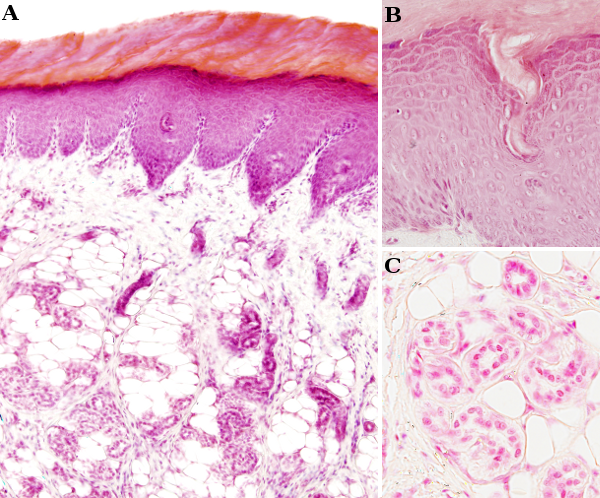 In the dermis, these ducts are made up of one or two layers of cuboidal epithelium and there are no myoepithelial cells close to the basal lamina. In the epidermis, the ducts lose the cuboidal epithelium, twist through the queratinocyte layers and finally reach the surface forming the sweat pore. Sweat glands has a significant role in the body temperature regulation, because the evaporation of the water released by these glands contribute to low the temperature. Sweat glands activity is under the control of the parasympathetic nervous system, although sweating can also be induced by emotions through the sympathetic nervous system.